Beekeeping courses: learn to keep honey bees | Norfolk U.K.
Beekeeping courses at Staithe Farm vary between short taster sessions of 1-2 hours duration to intensive two-day courses designed to enable students to competently keep bees by the end of the course. The taster sessions are suitable for complete beginners who wish to gain an understanding of what is involved in keeping honey bees. The courses are run by Richard who is a British Beekeepers Association (BBKA) Master beekeeper holding the Advanced Theory Certificate and the Advanced Husbandry Certificate. He is also a qualified teacher having taught science in a Norwich high school. This combination of beekeeping qualifications and practical teaching experience will ensure you receive the best possible tuition. The intensive course is for a minimum of two students and a maximum of four. Telephone support will also be available afterwards. Accommodation for two people may be available for the course in our holiday cottage, or available locally. Please see details of our holiday cottage or contact us. Richard is also committed to making his courses accessible to everyone, so if you have a disability please contact us and every effort will be made to allow you to access the fascinating world of beekeeping. 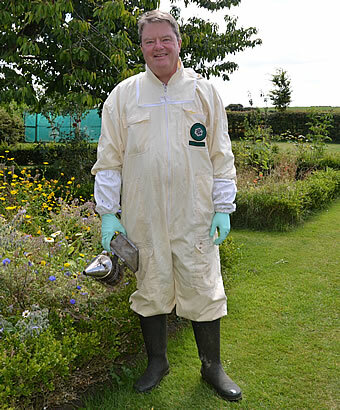 All equipment will be provided apart from footwear, but if you are serious about becoming a beekeeper, you may wish to purchase your own bee suit before attending. You are also advised to bring Wellington boots with sufficient space around the leg to allow the bee suit to be tucked into your boots.